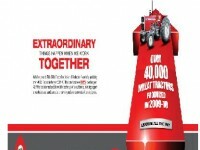 Friday, June 25, 2010, Lahore; Millat Tractors Limited set a new record of highest ever production by producing over 40,000 tractors in the year 2009-10 improving by 32% over previous year. To celebrate the occasion, the key of the 40,000th tractor was handed over to a farmer by Mr. Sikandar Mustafa Khan, Chairman Millat Group of Companies and Mr. Laeeq Uddin Ansari, CEO, MTL in a simple ceremony held in the company premises. Speaking on the occasion, Mr. Sikandar said that it was an outcome of Company’s commitment to support the Government for its program to enhance farm productivity and accelerate the pace of farm mechanization in the country. He thanked the Government for its farmer friendly policies especially the tractor schemes initiated by Federal and Provincial governments to make the tractors available to farmers having small land holdings. He further informed that the Company will continue its efforts to enhance production and offer new high-tech tractor models to the farmers of Pakistan suiting to their farming needs at affordable prices. Moreover, all out efforts are being made to extend after- sales-support to the farmers doorstep. He thanked all the customers for reposing confidence in Millat produced tractors and congratulated the Company workers, employees, vendors and dealers for achieving this record. Millat Tractors has been graded amongst the Best 200 Under a Billion $ Companies of Asia by Forbes Global.